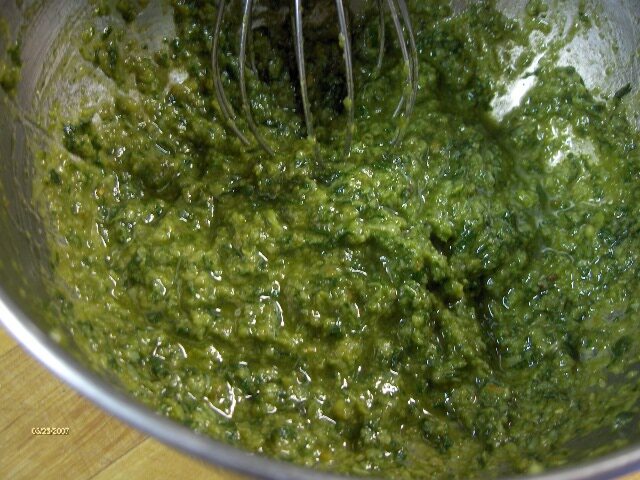 For my taste nothing compares to hand made pesto. 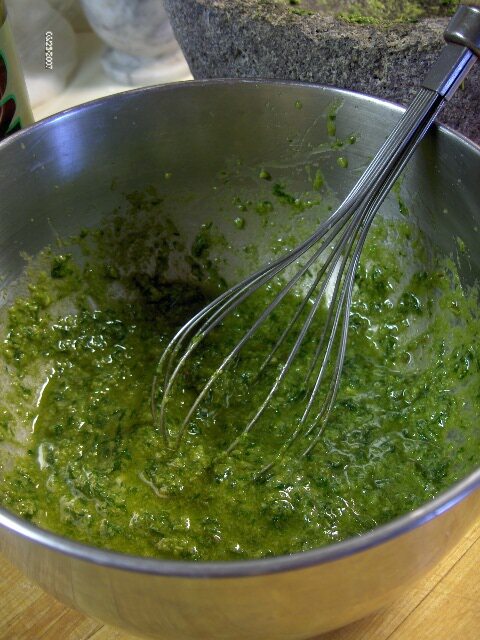 This beats pesto made in a food processor hands down. One time when I was in a hurry I considered pulling out the FP but couldn't bring myself to doing it. 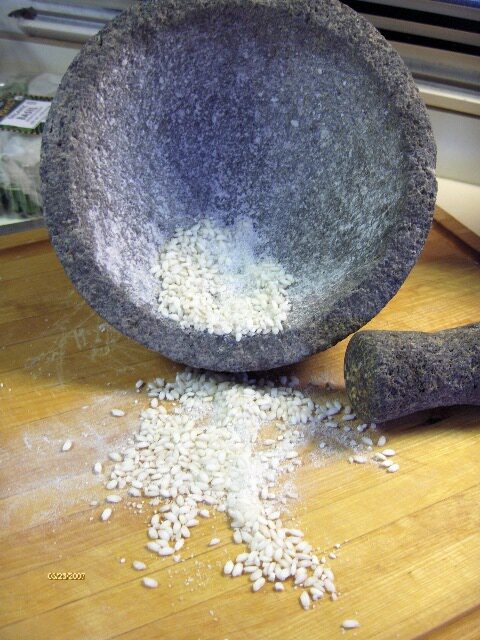 I keep the molcajete ready by pounding rice into it after cleaning it. I read that somewhere. 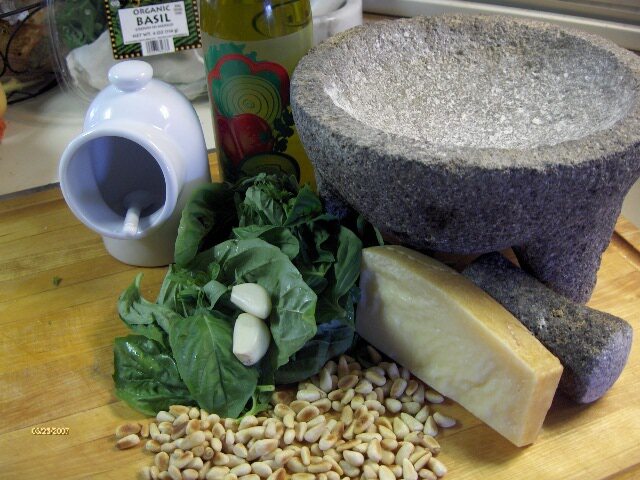 The assembled ingredients are basil, garlic, pine nuts, Parmesan cheese, salt and olive oil. 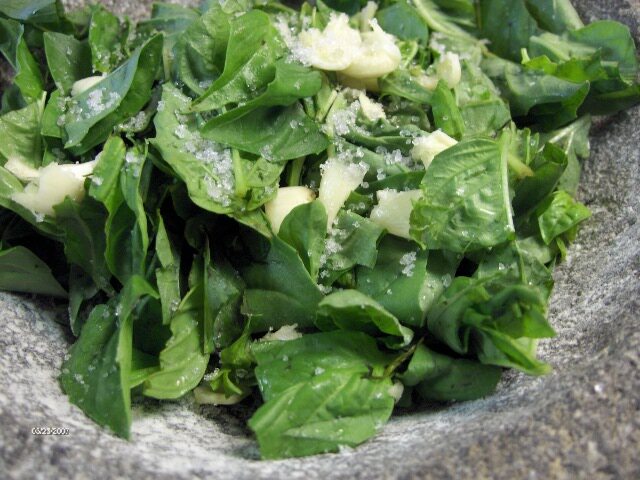 I broke up the basil leaves and added two garlic cloves and some salt. Half way through the mashing I added the pine nuts. 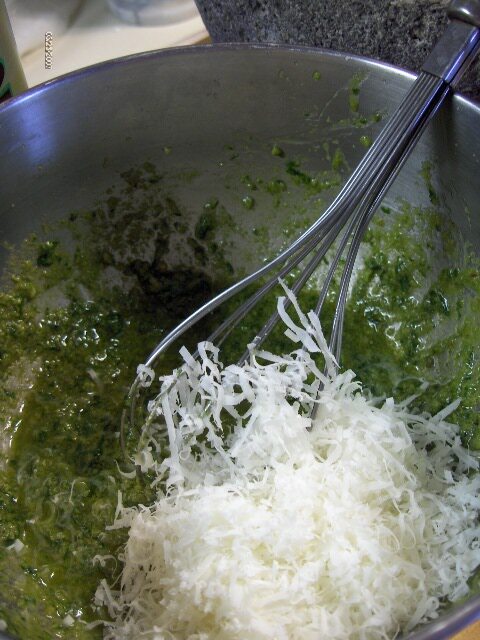 add olive oil until you get the consistency you like. I now switch over to a mixing bowl, it makes the whisking in of the olive oil easier. 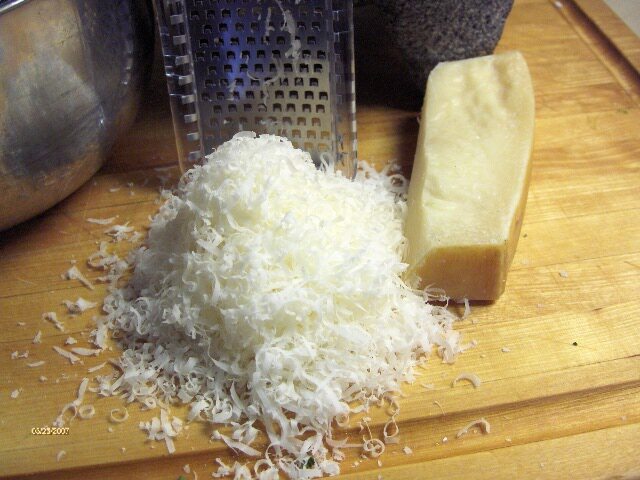 Grate up some good Parmesan cheese. as the recipe calls for. I probably added a little less than a cup. Lightly toast the piñon nuts in a small skillet. 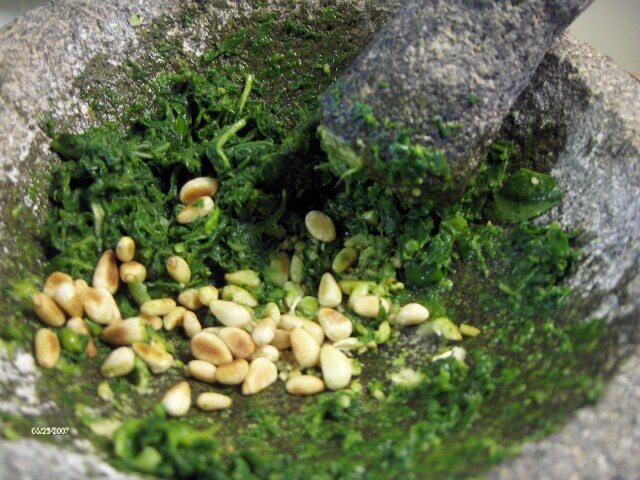 Combine the basil, garlic, and piñon in the bowl of a food processor. Leave the motor running and add the olive oil in a slow, steady stream. Shut the motor off, add the cheeses, a big pinch of salt and a liberal grinding of pepper. 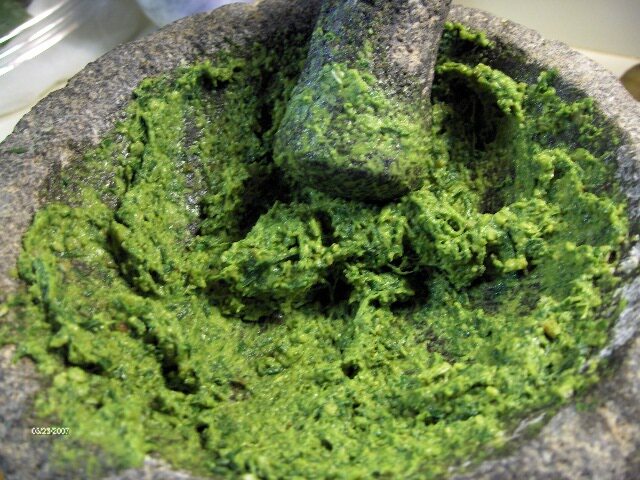 Process briefly to combine, then scrape out of bowl and cover until ready to use.